The dozens of young Chinese engineers looked nervous, but eager, as they presented their work in English during a hack-athon in September at the high-rise Roppongi Hills complex in Tokyo. But while the event hosted by Mercari Inc., maker of a popular flea market app, appeared to be a mere tech competition, it was actually far more. The hack-athon was, in reality, a part of a four-day, all-expenses-paid recruitment visit to Japan by top-notch Chinese engineering students. It featured 33 participants — all college students from China’s most prestigious schools, including Tsinghua and Peking universities. As Japan slowly begins to lower its drawbridges to less-skilled foreign workers, the job situation for high-tech foreign engineers stands somewhat different. Amid a dire shortage of IT-related engineers, major technology firms are increasingly venturing outside Japan’s borders to feed their unyielding hunger for talented tech workers. “I don’t think there will ever be a day when we can say we have enough engineers,” said Takaya Ishiguro, manager of human resources at Mercari. In an effort to appeal to prospective candidates, Japanese firms are hosting events, providing more options for office locations outside of the capital and offering more perks for foreign workers, including language lessons and support to make settling in a faraway country easier. “Basically, we need engineers in all sectors,” Ishiguro said. “Our management comes up with many new ideas,” but existing services need to be improved continuously. Because Mercari is aiming to increase the number of engineers to 1,000 from the current 350 in the future, “we think it’s necessary to reach out to the global workforce,” Ishiguro said, adding that the firm has been heavily promoting recruitment in India and China, including via events such as the hack-athon. This approach appears to be working. Zhou Bowei, a student at Tsinghua University and the eventual hack-athon winner, said Mercari seemed an attractive place to work despite the fact that joining the company, which doesn’t have an office in China, would mean he must move to Japan. “I want to work at Mercari in the future,” said Zhou, adding that the company’s corporate culture, working environment — as well as the pay — were among the most enticing features. Mercari did not disclose the number, but some Chinese students from the hack-athon are expected to join the company. 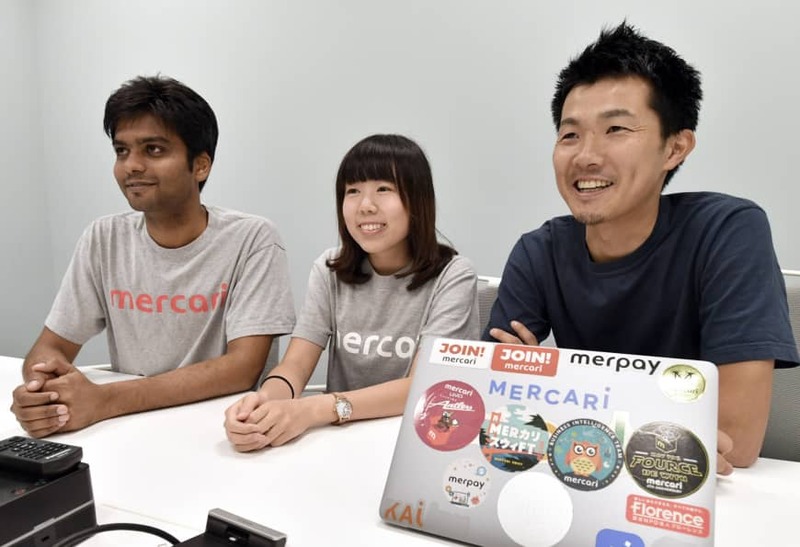 Having its stocks listed on the Tokyo Stock Exchange Mother’s section in June, Mercari is likely to grow even further, with overseas engineers likely to play significant roles in the company. Last month, Mercari held a ceremony for new employees that included 42 foreign workers from nine countries. Mericari has about 750 workers in Japan, 10 percent of whom are foreign. With this increase in foreign talent, Mercari has been working to improve its efforts to help them adapt to life in Japan. To that end, it has created a dedicated team that provides assistance in finding housing, opening bank accounts and getting cellphones, among other support services. It also encourages employees, including Japanese nationals, to become multilingual, offering English language lessons and arranging chat sessions at lunch or over coffee so that English — and Chinese-speaking employees — can mingle with Japanese workers. Banthia, a native of India who used to work at different Japanese firm, joined Mercari in March, hoping to see firsthand how a rising startup expands. He believes foreign engineers are essential for tech firms because they bring diverse perspectives necessary for the job. A tech company “solves problems using modern technology. … When you have a team with such diverse backgrounds and diverse experiences from different countries, there is a high potential of solving those issues,” Banthia said. In hopes of luring skilled workers both at home and form abroad with a chance to reside in Japan’s ancient capital of Kyoto, Line Corp., a popular messaging app service, opened a new development base in the heart of the city in June. The firm plans to raise the number of engineers to 3,000, from around 2,100, in the near future. At present, the Kyoto office has 19 engineers of which 10 are from overseas. 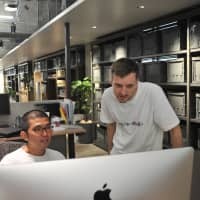 While more tech staffers are needed, “we won’t lower our hiring bar,” said Ryohei Miyota, who oversees the hiring of engineers at Line’s Kyoto branch. Still, Line has shown it is willing to be flexible with other conditions. At its Kyoto and Fukuoka bases, the firm is not requiring Japanese language proficiency, removing a hurdle for talented engineers who cannot speak Japanese. “From our experience, it’s hard to attract engineers if we require Japanese skills and some background in relation to Japan,” Miyota said. Prominent Japanese IT firms are often compared to other big-name tech giants around the globe such as Google and Facebook in the context of hiring high-level engineers — and domestic companies often fail to match up against the Silicon Valley powerhouses, especially in the salary department. But having worked at Google and Twitter as an engineer himself, Miyota touted Line’s benefits, including language lessons for foreign and Japanese employees. He also noted the appeal of the company’s two development bases outside Tokyo. The Japanese branches of foreign tech giants typically do not have offices for engineers at multiple locations. The pay at Line also remains the same even if workers move to Fukuoka or Kyoto, where the living costs are generally cheaper than Tokyo. Compared with Fukuoka, with its reputation as Japan’s “startup city,” Kyoto still lags behind as far as the tech sector goes. But that was not enough to stop one foreign engineer at Line from transferring to Kyoto from Fukuoka. “Of course, the experience to launch a (new) office … from the beginning, I thought that might be valuable as well,” said Frederik Vogel, a German national who joined Line three years ago. He said Tokyo is a bit too big for him, so the sizes of Fukuoka and Kyoto work well for him. Vogel added that Line allows him the freedom to work on things he enjoys while also providing the job security that comes with being employed by a major company. Japanese e-commerce giant Rakuten Inc. is no different when it comes to the hunt for talented engineers. The company hired about 200 in 2014, but that number shot up to the current 650 it takes in annually now. “It’s probably the organization that hires the most engineers in Tokyo,” said Francois Bergeron, a Canadian manager at Rakuten involved in recruiting engineers. This, he said, was due to its rapid growth. Next year, Rakuten is planning to enter the highly competitive mobile-phone carrier business, going toe-to-toe with Japan’s three giants: NTT Docomo Inc., KDDI Corp. and SoftBank Corp.
“In one year, we need to build a tech organization that will compete with established companies,” Bergeron said. With Rakuten also expanding its business to include drone delivery and finance, it can’t cover the need for engineers if it is only hiring in Japan, Bergeron said. “There is definitely limited talents in terms of volume in Japan,” he said. Currently about 80 percent of incoming engineers hail from overseas. Compared with other growing Japanese IT firms, Rakuten’s top advantage may be its brand recognition. This was established through sports branding, including sponsorships and partnerships with well-known sports teams such as Spanish soccer club FC Barcelona and the NBA’s Golden State Warriors. This year, Rakuten also started requiring all new graduates joining in April to take a six-month coding course. This was meant to enhance their knowledge of coding to be able to smoothly work with engineers—which has since turned into somewhat of a godsend, with some of those who showed good potential changing their career paths to become engineers. Although large IT companies may have the resources and know-how to recruit and nab talented engineers from abroad, doing so can be tough for small and midsize companies. 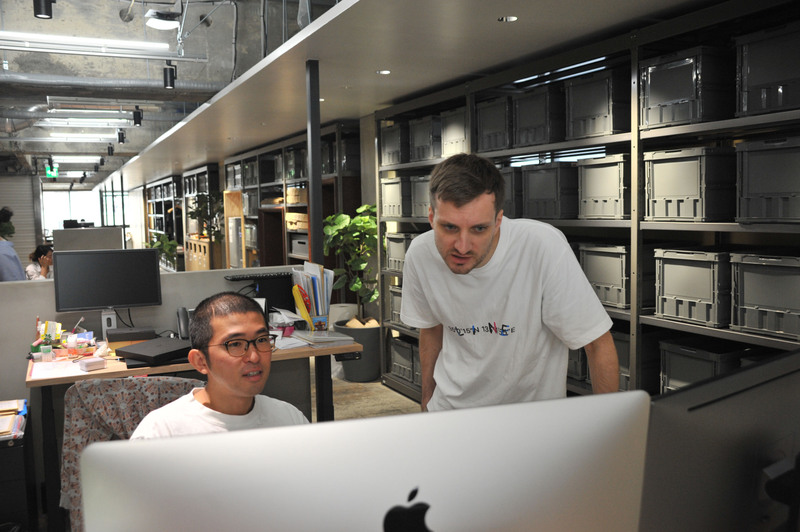 Some global-minded startups, however, are not limiting themselves to hiring within Japan. The engineer team at Ascent Robotics Inc., a Tokyo-based artificial intelligence and robotics startup, has about 70 workers, with the number of engineers increasing recently by around 10 each month. What’s more, 80 percent of these new engineers are non-Japanese. “It’s a result of simply hiring people who share the same dream, have necessary skills and can take action,” said Masayuki Ishizaki, CEO of Ascent Robotics, which was founded in 2016. The company receives hundreds of resumes each month, making it an overwhelming task to keep up with the constant influx of job-seekers. “In terms of getting applicants, we’ve never really had difficulty,” Ishizaki said. For Ishizaki, who worked in the United States for 20 years, diversity in the workplace is not something new. Indeed, he co-founded the company with Canadian national Fred Almeida. What is appealing for engineers at Ascent is the company’s vision — to build AI systems that can actually be put into practical use — rather than creating mediocre products in an amateurish manner, said Shinya Kawano, Ascent’s chief operating officer. Ascent, for instance, has created an AI system that eliminates the need for actually having to drive on real roads to collect data necessary for autonomous driving technology. Instead, Ascent’s system collects information and learns how to spontaneously respond to a variety of scenarios by driving over and over again on virtual simulations of roads. Beyond support such as language lessons and housing assistance for foreign workers, another key for recruiting overseas talents is an effort to strengthen global networks and outreach among engineers worldwide, Ishizaki said. Ascent sends its engineers to a number of tech and academic conferences, where they make speeches about their research and findings. This allows them to learn about the latest technological advances while also spreading the word about the firm’s own developments. It also strengthens the bonds between those engineers inside and outside the company. “You can think of it as something like an invisible network of engineers” that enables the firm to hire fresh talent, Ishizaki said. Yohei Shibasaki, CEO of Fourth Valley Concierge Corp., a Tokyo-based global talent recruiting firm, said the truth is that major Japanese IT firms that can offer high salaries and work environments with less demanding language barriers for foreign workers have had no real trouble in securing new hires. Still, the number of such companies, remains limited. U.S. tech firms hire engineers for their domestic offices mainly within the states, which means they aren’t hiring from outside the country, except to recruit students at the Indian Institutes of Technology, India’s top technology college, said Shibasaki. It is also difficult to obtain the H-1B working visa for highly skilled workers in the U.S., making it exceedingly difficult to hire foreign workers. “There really isn’t a cross-border competition” of recruiting overseas talents for Japanese firms, said Shibasaki, whose firm has worked with Mercari and Rakuten. Major Chinese IT companies, such as Alibaba and Tencent, also hire mainly from within the country, allowing Japanese IT firms a chance to acquire top talent in developing Asian countries, where income levels are lower than Japan, he said. But if Japanese firms want to remain attractive work destinations for foreign engineers, they need to develop personnel systems that set clear standards of how employee performances are measured, since many Japanese companies can be vague in this area. Every month Deep Dive takes an in-depth look at a topical issue in Japan.